In a large (4-quart) saucepan set over medium heat, bring the chicken broth to a gentle simmer. Lower the heat and hold at a simmer. Set a large (10-inch) ungreased skillet or heavy griddle over medium heat. Toast the chiles a few at a time, pressing them against the hot surface with a spatula until aromatic and lightened in color underneath—about 10 seconds per side. Transfer to a blender jar and add ½ cup of the fresh or reconstituted masa, the hoja santa (or cilantro) and 1 cup of water. Blend to as smooth a consistency as possible. Set a medium mesh strainer over the simmering chicken broth and pour the chile mixture through the strainer, stirring to incorporate the chile into the broth. You may need to increase the heat to keep the sauce at a gentle simmer. Simmer the mole, stirring occasionally, to blend and soften the flavors and cook the masa (the sauce will look noticeably thicker)—about 15 minutes. Taste and season with salt, usually a generous teaspoon. Cool to room temperature; it should look like a very thick gravy. Heat a large (10-inch) skillet or griddle over medium high. Season the remaining 2 cups of fresh or reconstituted masa with salt (usually a generous teaspoon) and dribble in water if needed to bring the masa to the consistency of soft cookie dough. Divide the dough into 10 equal balls (roughly the size of a golf ball). To form an empanada, use a tortilla press to press each ball into a 6-inch round. Lay the dough on the hot skillet or griddle. After about 30 seconds when the edges just begin to release from the hot surface, flip it. Lay a few tablespoons of the shredded chicken, a generous tablespoon of the mole and a few of the torn hoja santa (or cilantro) leaves over one half of the dough. Dampen the edges with water and fold the unfilled tortilla over the filling creating a half moon shape. Use your fingers to press the edges together and gently seal the empanada. Continue griddle baking it, turning it every minute or so, until the masa is golden and splotchy and cooked completely through—about 10 to 12 minutes. Repeat until all the empanadas are cooked. Serve immediately. The above recipe makes no mention of shredded chicken in the ingredients. It’s not mentioned until the final assembly paragraph. Glad to see the empanada dough part, though! You are correct Gloria, you can buy a rotisserie chicken and then shred it. Then when you are filling the empanadas (in the final paragraph) you will use the shredded chicken. My grandma used to make minced meat empanadas. I believe minced meat and peanuts were two of the ingedients do you have a recipe like that. We do Tim! 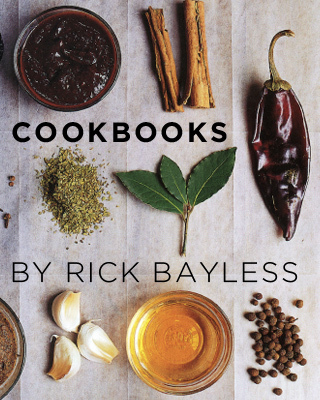 Rick’s first book, Authentic Mexican has a recipe for Empanadas de Picadillo. to get the recipe for Charro Beans and cannot get that one and only recipe that I want. PS I have always for years been a fan but what is up? Esther, you’re in luck. We’re launching a new YouTube Channel soon. One the first recipes we’ve posted? Charro Beans. And here’s a link to the recipe on the website.